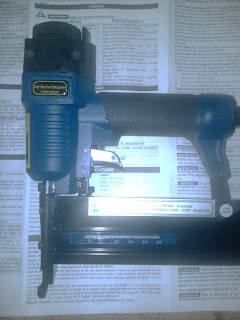 Mama's Got a Nail Gun--Finally! I was at Harbor Freight for work last week (long boring story), and naturally I started "personal shopping" in the nail gun section while waiting for the chemical engineer to get the paint guns. Anyway, I saw this 18 gauge COMBINATION nail gun/stapler, which will do all kinds of finish work, paneling, wainscoting, cabinetry, and generally everything COOL. It was only $29.99. Here is my terrible picture of it. I figured out how to load it but...I am having trouble unlocking the trigger. It says clearly on the instruction sheet to "release the trigger", but there's no picture and it's not obvious, so now I feel like an idiot. Also, my dad has had a huge air compressor since I was old enough to watch him work on the house...but I've never had one of my own. This is important!! My dad bought me my first drill, my first miter saw, and then my ex funded the purchase of the other tools sitting in my garage. I've never bought my own, for myself, with my own money. I started back to work full time last fall. Since then I have avoided any gigantic house remodeling projects because there simply was no time. But then we got snowed in a few weeks ago...and I started tearing into the living room...and now I have to finish this! I was gluing the scrap pallets to the wall, but they aren't "sticking" very well. I need a nail gun or I'll never finish this. And I realized -- this project was not a good idea. I don't know what I was thinking. I work 40 hours a week, I have three little kids, and I'm doing everything MYSELF! I must be out of my mind. I grew up with a dad and three brothers who could build or fix anything. I've yet to date a man that can do anything, including nailing two boards together. I have so many tools (and begged for a nail gun) that my mother absolutely refused to buy me any this year. proclaiming "I am NOT buying you any more BOY gifts!" Bwahahahahaha! You are totally not out of your mind. There's a huge sense of accomplishment that comes with completing a project on your own. I have a lot of pallets to use! This is really awesome! I just can't get over how ingenious this is. I found your blog through Poppytalk and I'm now your latest follower. Look forward to reading more posts! 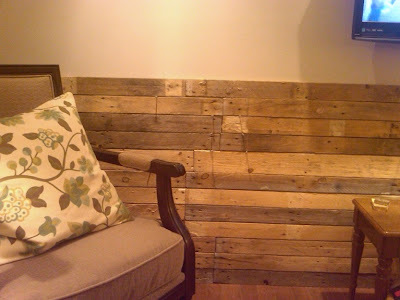 I just found your blog through Poppytalk as well and I love this nail gun post! My dad was a contractor so I always grew up with tools around the house. When my husband and I bought our first house I couldn't wait to buy my first miter saw, nail gun and drill (I think he thought I was crazy!) but I use them (especially the nail gun) all the time! Just this past Christmas, I begged for a nail/brad gun and pancake compressor. I even sent email clippings from the ads on Black Friday to my son. Instead, he bought me some very nice gifts (actually his wife bought most of them) and gave me a nice gift card at Lowes so that I could "pick out the one you like". So, card in hand I went shopping. All the prices were through the roof! So, here's a question - Do you like the gun you bought? I have a Harbor Freight nearby my office. 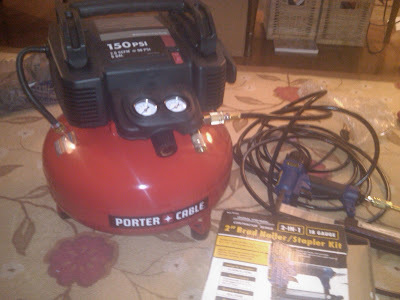 I can always continue to look for a pancake compressor but the price for the nail gun is terrific! For starters... they are great. Get the brad nailer/stapler combo and watch out for coupons, they go on sale for under $20. I use name brand nails on them like dewalt, senco, hitachi and work great. STRONG ADVISE... Read the manual and always wear eye protection. If you stop and will not be using it for a while in the middle of a project, disconnect from the air hose for safety reasons.